TS Corporate Colleges Free Inter Admissions Results 2018, Seat Allotments are announced/ TS Corporate Colleges Free Inter Admissions notification 2018, TS Corporate Colleges Inter 1st year admissions, Inter Admissions into TS Corporate Colleges 2018, Inter 1st year Free admissions in TS Corporate Colleges 2018 under Corporate Education Scheme, Corporate Admissions Online Application Form, Invites Applications: Corporate Admission Application Registrations Last date is : 16-06-2018: Telangana State Government would issue the Corporate Colleges Inter Admission notification 2018 schedule and applications are invited from the SC, ST, BC, EBC, disabled and Minority Students 7.0 GPA SSC 2018 Passed Candidates for admission into Intermediate courses in Corporate Colleges for the academic year 2018-2019. So, interested AP SSC Students can apply through online mode apepass.cgg.gov.in Web Portal and interested TS Students can apply online on telanganaepass.cgg.gov.in Web Portal. Social Welfare Department has issued admission notification 2018 through press media for admission into corporate colleges. The Social Welfare Department invites online applications from the eligible candidates for admission into Corporate Colleges for this academic year 2018-2019 in both sates of Telangana and Andhra Pradesh. Students who are belongs to the categories of SC,ST whose annual parental income is Rs. Two Lakhs or below. a. BC & Minority Welfare Students who are belongs to rural area family income should be Rs. One Lakh Fifty Thousand or below. b. BC & Minority Welfare Students who are belongs to Urban area family income should be Rs. Two Lakhs or below. Corporate colleges have registered their College on online from: 28-04-2018 to 07-05-2018 and printed copy has been submitted at Collectors Office. Eligible Corporate Colleges list should be displayed on or before 20-05-2018. 13) CBSE Students has to contact the District officer for SSC Details Entry. 14) HPS Students has to contact School/DD(SW) for SSC Details Entry. b. CBSE Students has to contact the District officer for SSC Details Entry. c. HPS Students has to contact School/DD(SW) for SSC Details Entry. Interested TG students can apply from 19-05-2018 to 10-06-2018 through online mode at https://telanganaepass.cgg.gov.in/ web portal. Interested AP students can also apply through online mode at https://apepass.cgg.gov.in/ as per schedule. Step 3: Click on the Image of Corporate Admissions. Step 8: Click on the Get Details and download your seat allotment order and preserve the future reference(for attending the certificates verification). 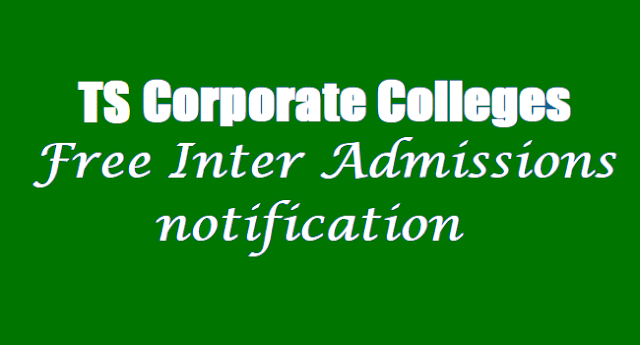 Sir please update the information about corporate collage admission results. Which u have mentioned that the above important dates are not correct by that we are struggling for further admission please respond on these issue we are eagerly waiting for the results. Please update us the exact admission list date. Please update us exact admission selection list date for Telanagana corporate Inter admission 2017 list. We eagerly waiting for the update. Have to submit hard copies to district collector office or not ?? When Will release corporate college admission selected candidates list? When will release corporate second phase selected candidate list?